Air conditioner switch is OFF. Rear window defogger switch is OFF. Steering wheel is in the straight-ahead position, etc. For procedure, refer to EC-493, "Inspection". For specification, refer to EC-500, "Idle Speed". 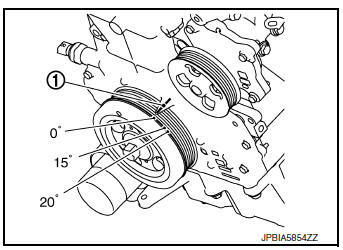 Check camshaft position sensor (PHASE) and circuit. Refer to EC-298, "DTC Description". Check crankshaft position sensor (POS) and circuit. Refer to EC-295, "DTC Description". Perform initialization of NVIS (NATS) system and registration of all NVIS (NATS) ignition key IDs. Refer to SEC-65, "ECM : Work Procedure" (With intelligent key system) or SEC-153, "ECM RE-COMMUNICATING FUNCTION : Special Repair Requirement" (Without intelligent key system). For procedure, refer to EC-494, "Inspection" For specification, refer to EC-500, "Ignition Timing". For procedure, refer to EC-494, "Inspection". For specification, refer to EC-500, "Ignition Timing". Check timing chain installation. Refer to EM-45, "Removal and Installation".